So, is it refreshingly honest or just sort of a bummer when you finally realize you can’t have kids/a dog and perfectly clean rugs? t was about 50/50 for me. 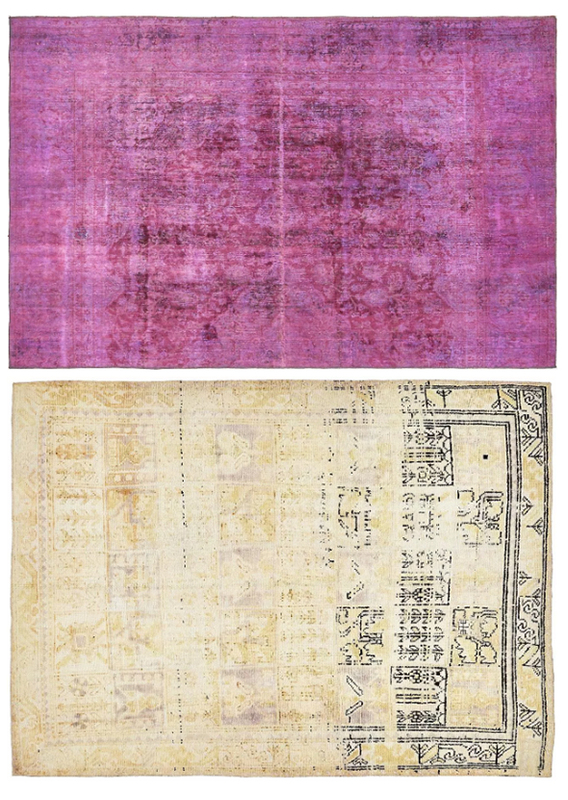 The last two rugs we had in our living room had entirely too much white in the pattern, which is to say ANY AMOUNT OF WHITE. I feel like we’re pretty clean people but it seems like even the tiniest bit of white was getting dingy so fast. It just wasn’t a great look and I knew it was time for an easier solution. So I tossed up my white-rug white flag and took my own advice that I often give to clients with kids and pets: if little feet touch it, make it the color of dirt. 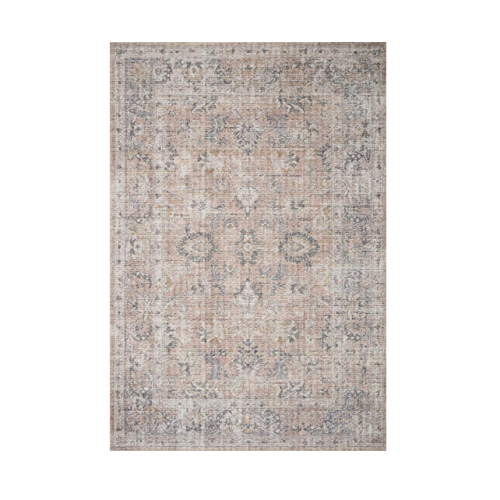 I had selected this beautiful, well-priced and ENORMOUS rug for a client recently and when we ended up going sans-rug in her space, I happily picked up this beauty for myself to replace the white moroccan style we’ve had in the living room for the last 8 months or so. 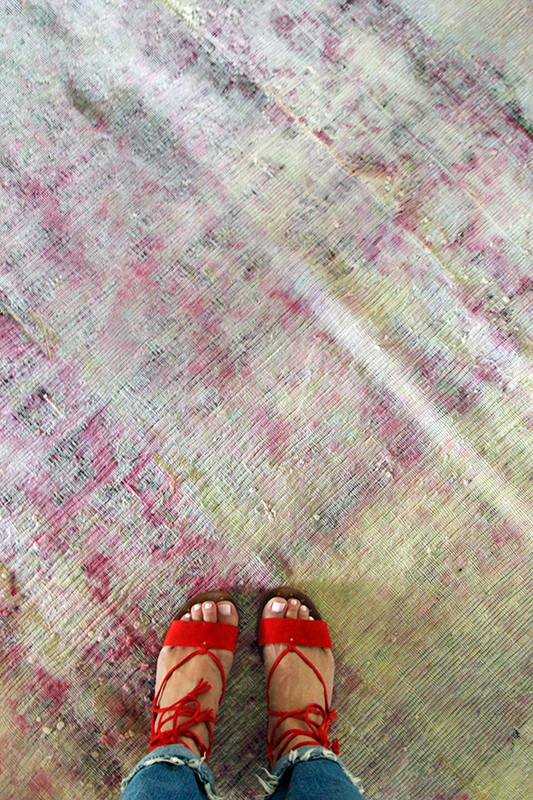 I’ve been using eSaleRugs for my own home and clients for years and their rugs are consistently even better in person than in the photos (and I’ve found the opposite to be true with eBay rugs!). While it’s not exactly the color of dirt, there are no sections of the pattern that are white. :) In general though it’s still light and airy – just what this shadowy room needs! The rug straight up camouflages dog prints and kid mess alike – I’m thinking of a couple recent tragic lego+bare foot incidents. Ouch! 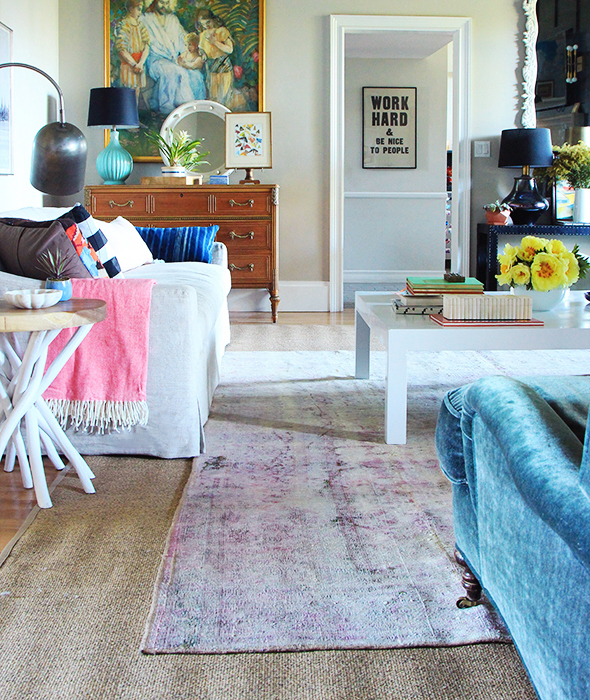 That pop of hot pink makes my heart skip a beat every time I walk in the room, but you wouldn’t really call it a pink rug, you know? It’s not at all overly girlie. It layers with my cheap IKEA sisal like a CHAMPION. I suddenly love my white coffee table again after months of considering getting a new one! Sometimes it just takes a new backdrop to love your furniture again. Pretty thrilled with our new rug and how it’s holding up! Here are a couple more from eSaleRugs that I had saved in my cart for consideration. It looks like they’re having a Black Friday preview sale today and everything’s 50-60% off, too! Happy shopping! I hear you on the 50/50 feeling when the decision is made. After living with a plan B, I tend to lean towards the “refreshingly honest” side. I wanted a marble coffee table for what felt like forever, and I finally found a vintage one on craigslist for a steal. It looked great in our living room, but our two dogs kept bumping into it while they were wrestling. Our house is only 1000 sf and our yard is small, so wrestling in the living room isn’t stopping any time soon. The second time they cracked the wood apron of the table, I took it upstairs to await another repair. In the meantime we used two poufs in place of a coffee table…6 months later, the coffee table is still awaiting repairs and the poufs are still our primary coffee table. I love the marble table, but the poufs function so much better for us. Hi Zoe! Glad to be back! 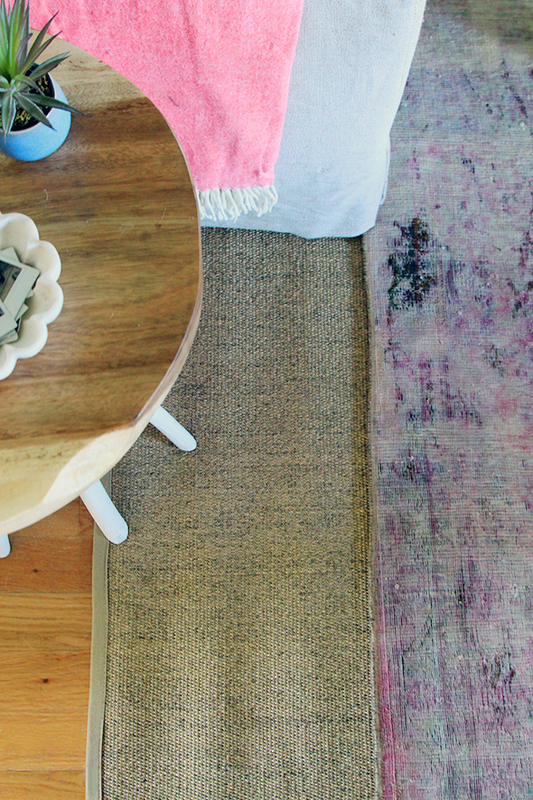 :) This rug is part of the Ultra Vintage line. The pile is very low, but I wouldn’t describe it as threadbare necessarily? It’s like a sisal/persian hybrid. I love it! Thanks Amanda! I scored the sandals two or three weeks ago on super sale at Madewell. They were only like $20! I love seeing your beautiful home again! So glad you’re back! Everything you do is amazing! Love your new rug! But can I ask where your light fixture is from? 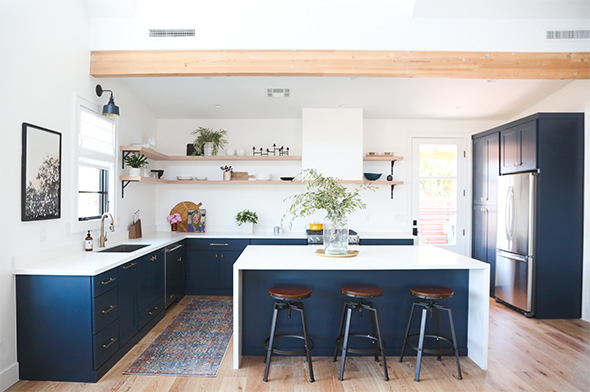 I’ve been loving this fixture since you first posted it too – thanks for the source! Just curious (since we’re couch shopping), where di your sofa come from? I love the profile of he blegian track arm and am looking for a long bench cushion. And a washable slipcover. In other words, the holy grail of sofas! Just curious (since we’re couch shopping), where did your sofa come from? I love the profile of the belgian track arm and am looking for a long bench cushion. And a washable slipcover. In other words, the holy grail of sofas! This is the 9′ Belgian linen track arm from RH in the luxe depth. We’ve had it for 8 months or so and still LOVE it! I second the sofa question! Is it the RH belgian linen track arm? I’m thisclose to ordering one but I’ve read some pretty negative reviews, especially about the down cushions flattening out fast. Would love to hear how you like it! 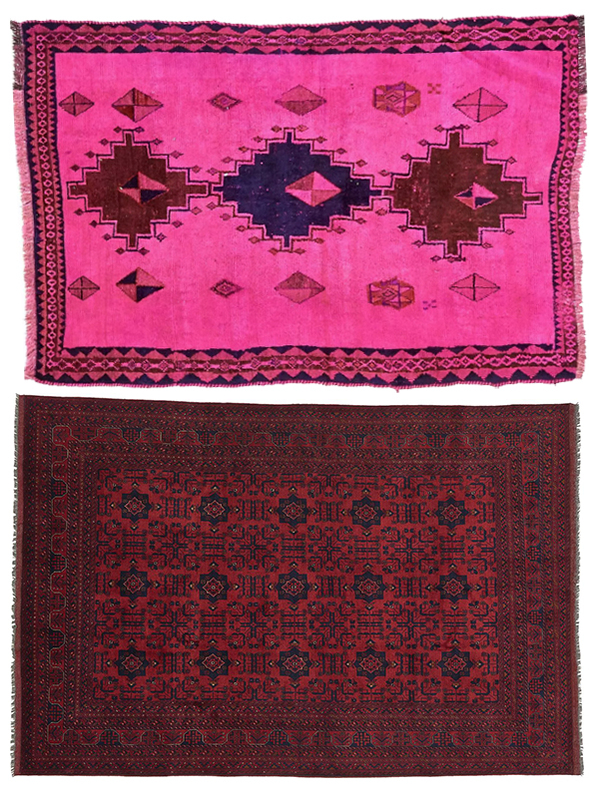 PS – I’ve been a loyal esalerugs shopper ever since you posted about that gorgeous colorful runner you had in your NYC loft kitchen years ago. They have the BEST service, and I refer them to all my friends. Thanks so much for sharing gems like them with us! Sheri, glad to hear you love eSaleRugs too! They really do have great customer service and the best selection. The sofa is from RH! I have no complaints about the cushion. I think the people who write those reviews have never had any down filled/wrapped cushions before. You just have to accept that every once in a while you have to pull all the cushions off for a fluffing session. I probably do it once a month. It’s not bad at all! Thanks so much, Jenny! I’m so glad to hear you love the sofa; the single bottom cushion and the luxe depth really can’t be beat. I’m a frequent couch-cushion-fluffer anyway, so I’m sure I’m up for the down pillows. Thanks again for the response, and Happy Thanksgiving! Same to you, Sheri!! One other thing I wanted to mention – I thought long and hard about upgrading the fabric to one of the Perennials linens. I use this sofa a ton in my client work and have often recommended the outdoor fabric for homes with pets and kids. For time and money purposes, I went with the standard linen stocked option and I am so happy with how the fabric is holding up to stains! I think I’ll probably have it scotchguarded at the one year mark but so far so good! Let me know if you have any other questions about the sofa before ordering! I think you’ll love it as much as I do. 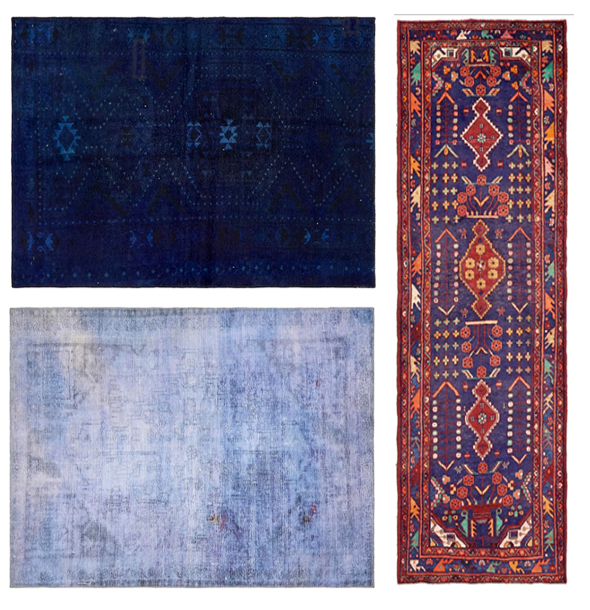 Love these rugs and esale is definitely on my shopping list now! 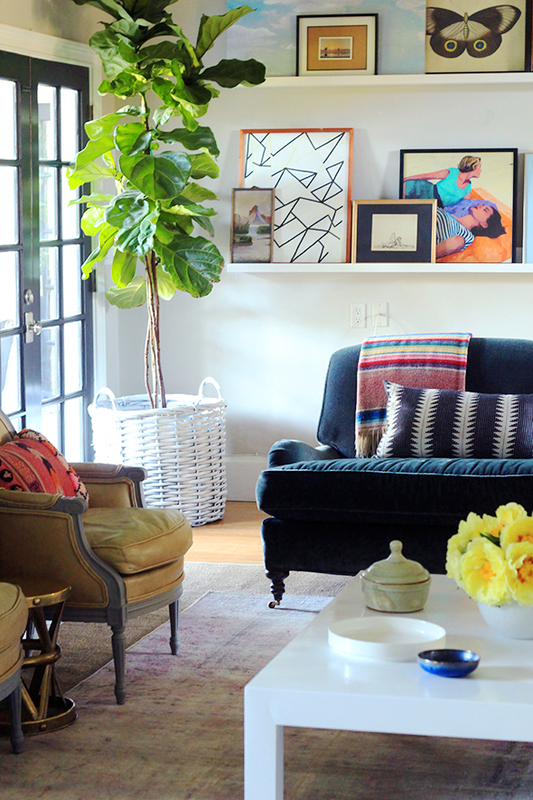 Something I would love to see from you is a round up of colorful and/or patterned sofas. I think you use color really well, and as someone who is afraid of color it would be awesome to see your thoughts! Welcome Back!!! I can’t tell you how excited I am that you’re blogging again…You have been sorely missed. 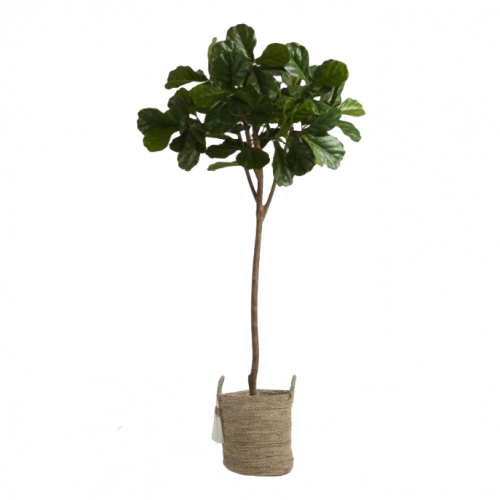 Question about your Ikea sisal: did you put two together? If so, did you do anything special to hide the “seam”? yes! 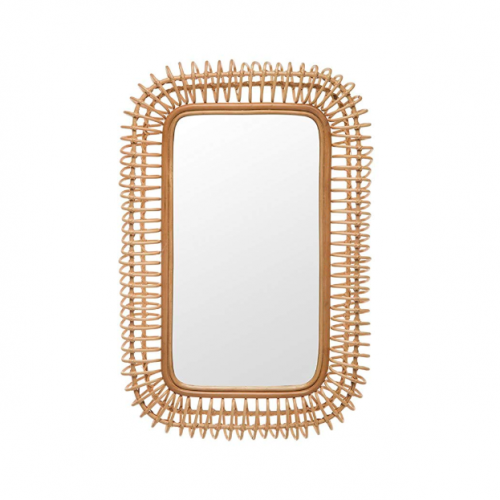 same question… how did you get such a large sisal from ikea? and so glad you’re back!! I put two of the 8×11 rugs together! :) The new rug covers the seam! 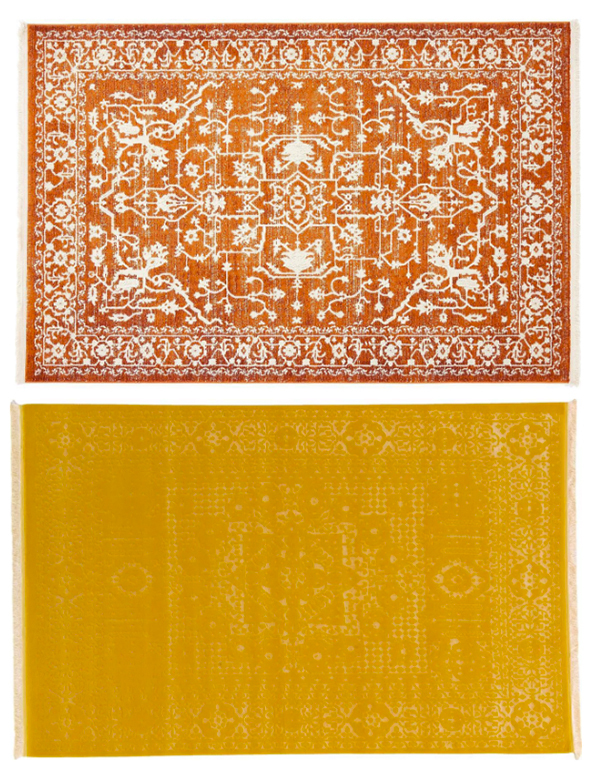 Totally just bought that crazy bright yellow one as an antidote to our low-morning-light living room. I’m crossing my fingers that its the one I’ve been looking for (and feeling good about it!). Thanks as always for your spot-on suggestions! 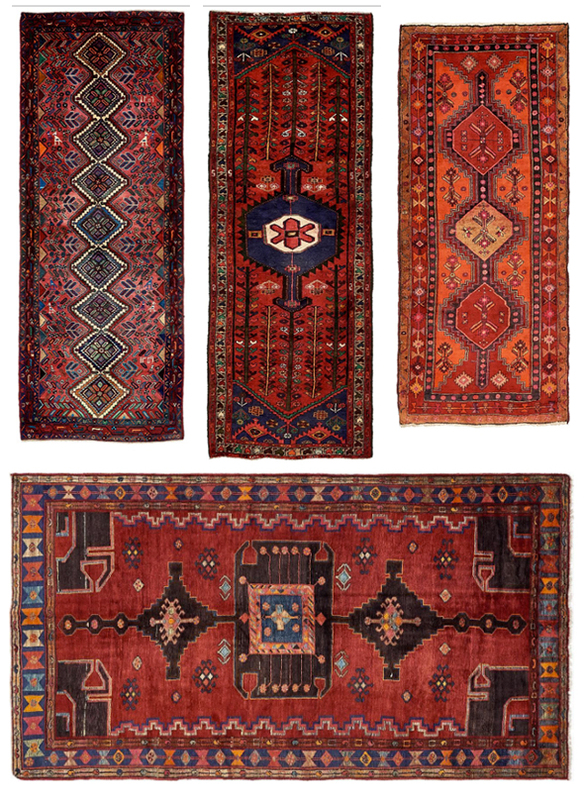 I was looking for some gorgeous rugs for my guest room. Ahhh! Finally I got here. 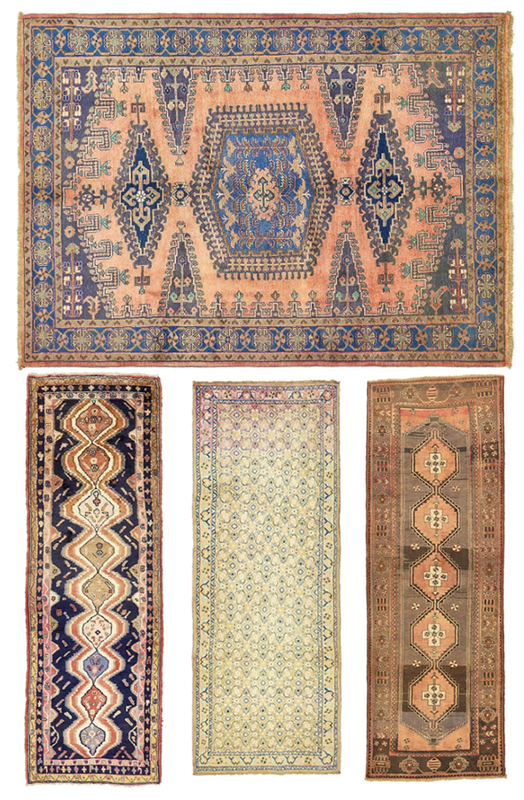 All rug choices are superb. 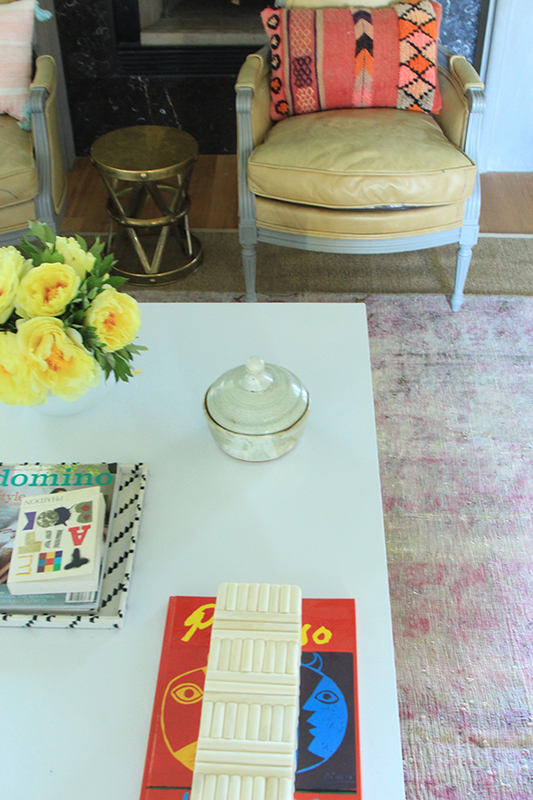 I really loved the pink colored rug and will get the same for my guest room. Looking forward for more home décor ideas! Hi! First let me just say how ecstatic I am that you’re blogging more!! I know you’re a busy lady, but I’ve sure missed you!! Now because I love your work so much, it’s important that I can obsess over every little detail. Ha! I’m finding that the picture quality has gone down exponentially in resent posts. (I first noticed it in the recent post you shared of the modern cabin you designed.) The images are small, and when I zoom in, they’re super fuzzy. I looked back in your archives, to be sure it isn’t my iPad, and they’re all sharp and readable. I’m soooo not techy, so forgive me for the simple terms and descriptions! Hi Rachel! The coffee table was a vintage find that I painted white. It’s super sturdy and a pretty great size! Hi Jenny! So excited that you are blogging regularly again! Do you have a place on your site that lists where you got everything in each room? If you don’t, no worries–that would take SO much work to put together. I’m specifically wondering where you got the black (?) and white pair of pillows on the couch. Thanks! Wait! 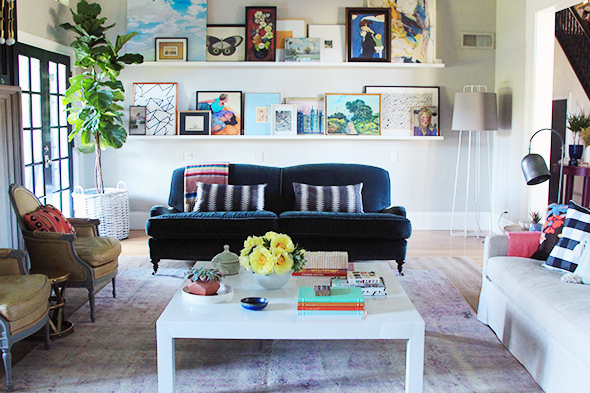 You are worried about a light rug and not about that light (and beautiful) couch? I want a couch like that but I am SO scared to get one. How do you keep it clean? Hi Jenny! Where is the English roll arm sofa from? And what is the fabric? I have been looking for one in that color for so long! And I’m super excited you’re back too. Extra bright spot in my day. Thanks! Hi Elisa! Thanks for stopping by! :) The sofa is by Lee Industries. 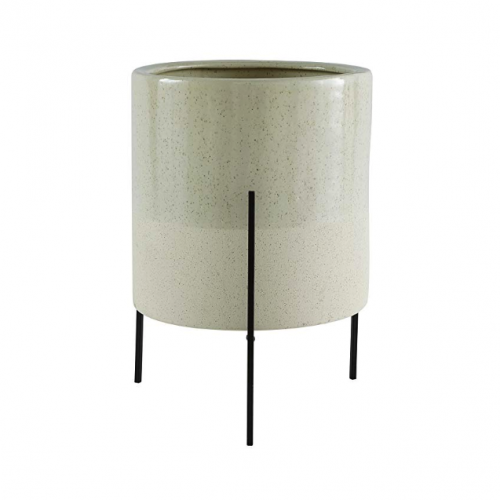 Crate and Barrel sells the brand sometimes, but you’ll have a local distributor for sure – just check on their site. I love the quality! Interior Define is another place to find a roll arm without having to deal with a salesperson. Hope that helps! Hi Jenny! I’ve got two little girls myself (1.5 and 4 years old) and I’ve been living with a brown/dirt colored rug since my 4 year old was born exactly because I figured messes wouldn’t show. It works! But it’s so dark and depressing. 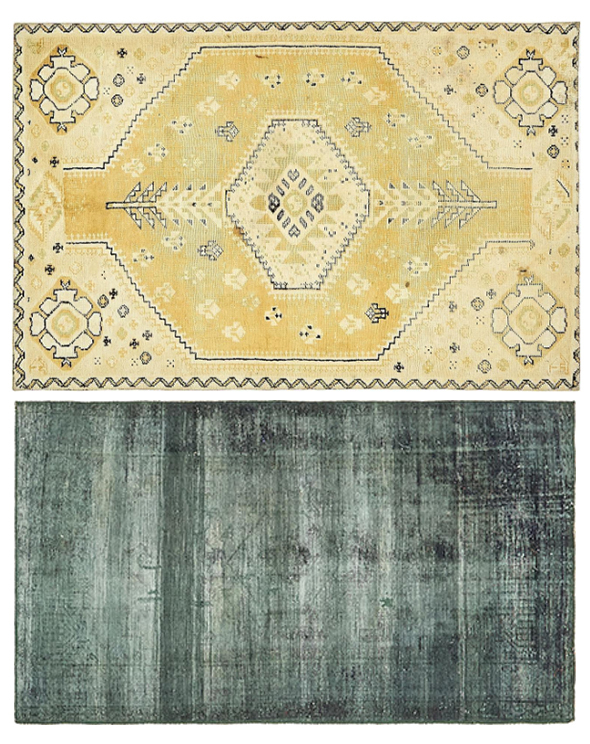 I actually bought the bottom-most rug in your “consideration set” photos (the Ultra Vintage with the extreme fading on the left side) in hopes of brightening things up. I LOVE it. But now I’m worried that it is actually too light. Thoughts?? Buying it! And wow. A little star-struck that I got my first reply from THE Jenny. ;) Thank you for bringing a little fun and cheer with all your posts. I love all your work. Love this blog post! 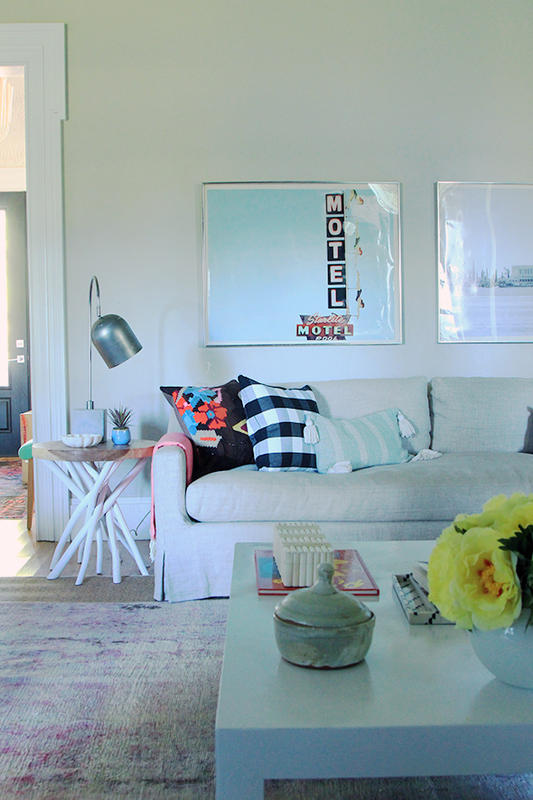 Thanks for the tips on choice of colour :) Your living room is stunning too! Just want to say I LOVE seeing you here again. Have missed you and your beautiful posts!! Hi! Troving your blog and catching up – where are those large white shelves from behind your couch? Thanks! hi – i may have missed this. where is the couch from? I just found your blog after listening to the YHL podcast this week. I feel like I’ve been missing out on so much and am so glad to have a new place for design inspiration. 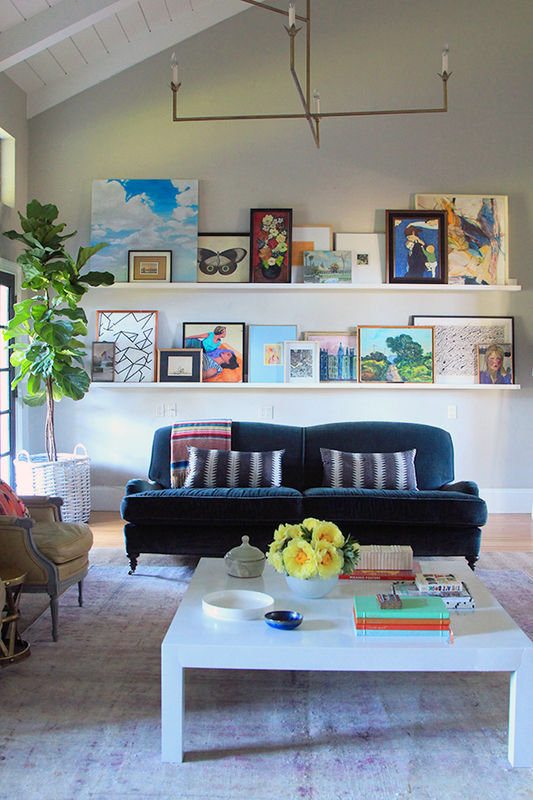 Quick question: Can you tell me where you purchased your picture ledges that are in the photo behind the blue sofa? 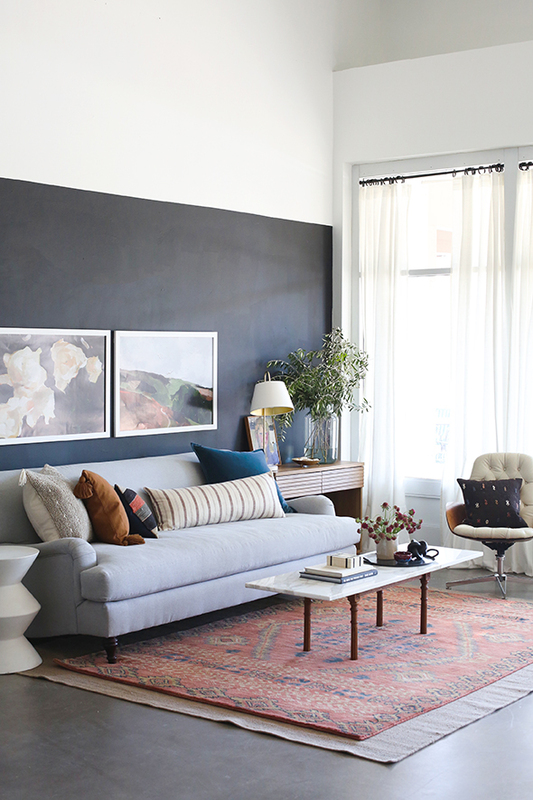 I just moved into a new home and previously had a gallery wall in our living room and have been looking for an option that would be different but similar for our new space. Beautiful space! Can you give any info regarding the french style yellow arm chairs? I’ve been looking for something similar for our sitting room and am turning up empty. Thanks! What is your living room paint color. Love the mix of colors on a neutral background! My son would love that orange rug! Where can I find a high gloss white coffee table like that?